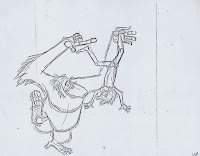 There's no way this is going to be a brief post, I have too much good material of this character to share with you. 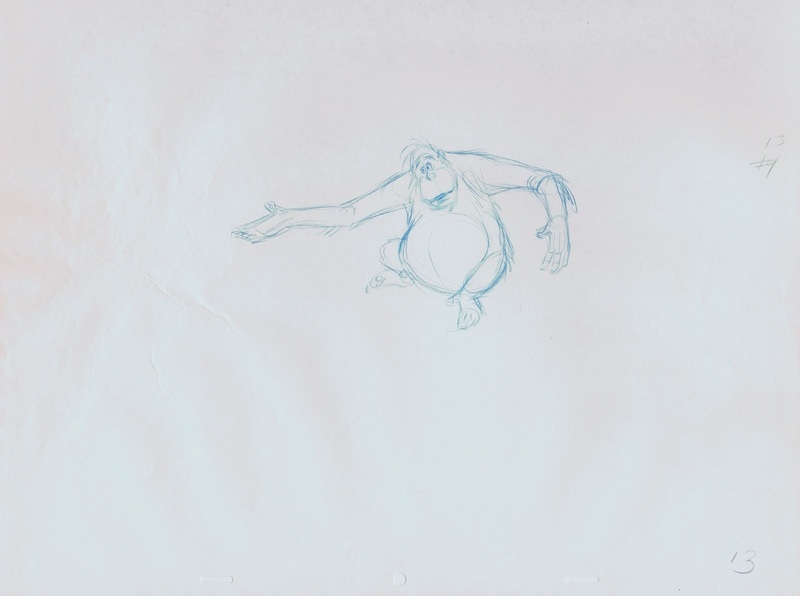 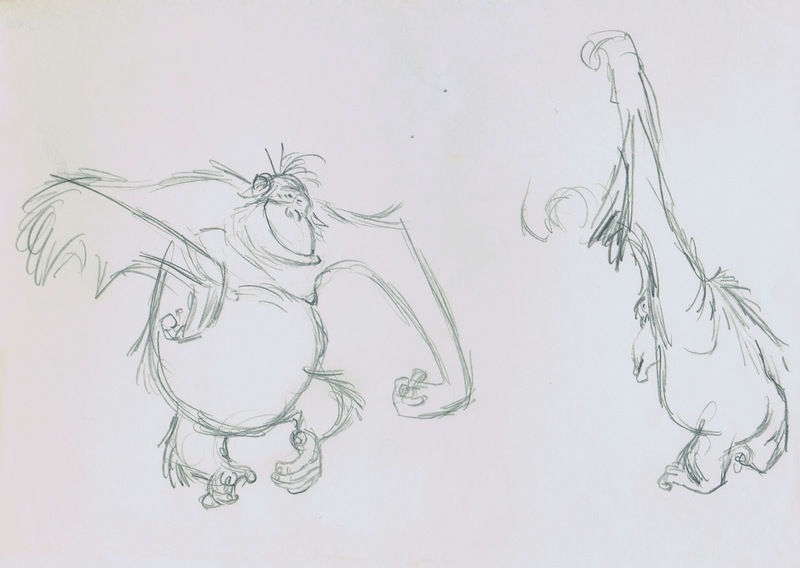 The "King Louie" sequence in Jungle Book is one of my favorites. 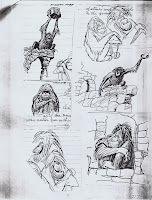 I love the opening Multiplane truck toward the Ancient Ruins accompanied by atmospheric jungle rythms. 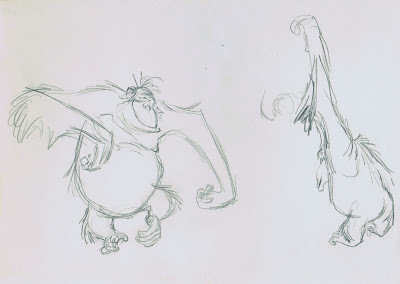 The first handful of scenes with King Louie were animated by Eric Cleworth, who in my opinion did stronger work on the elephants. 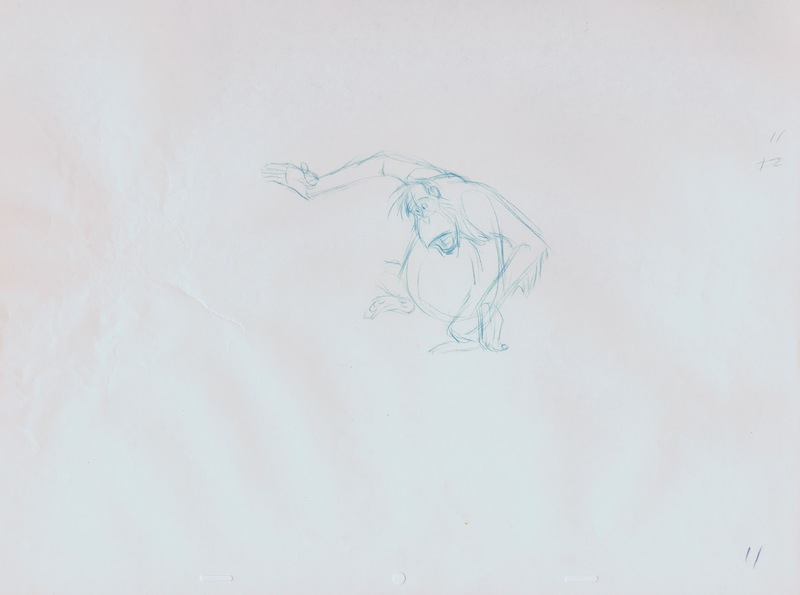 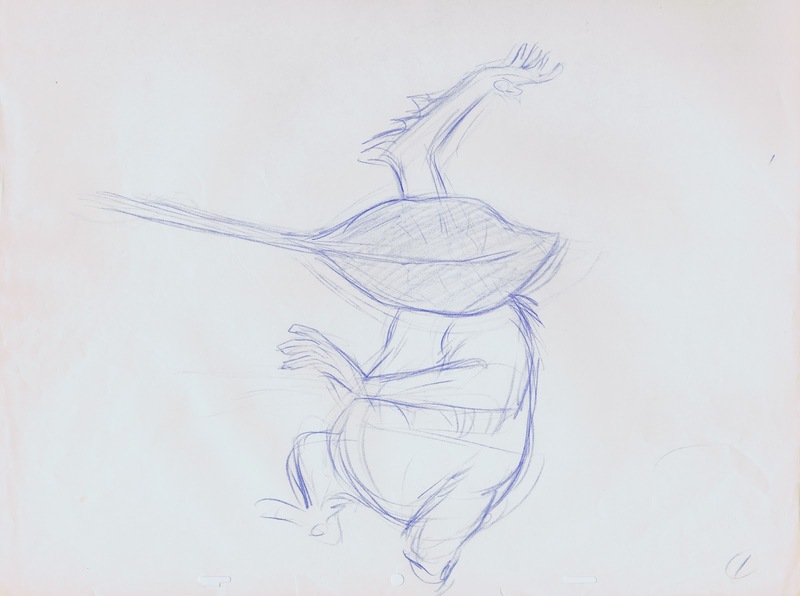 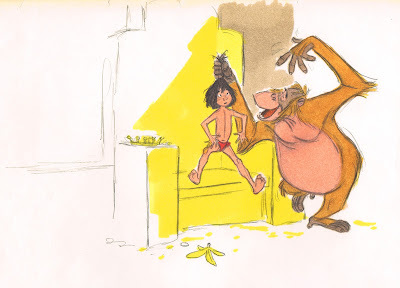 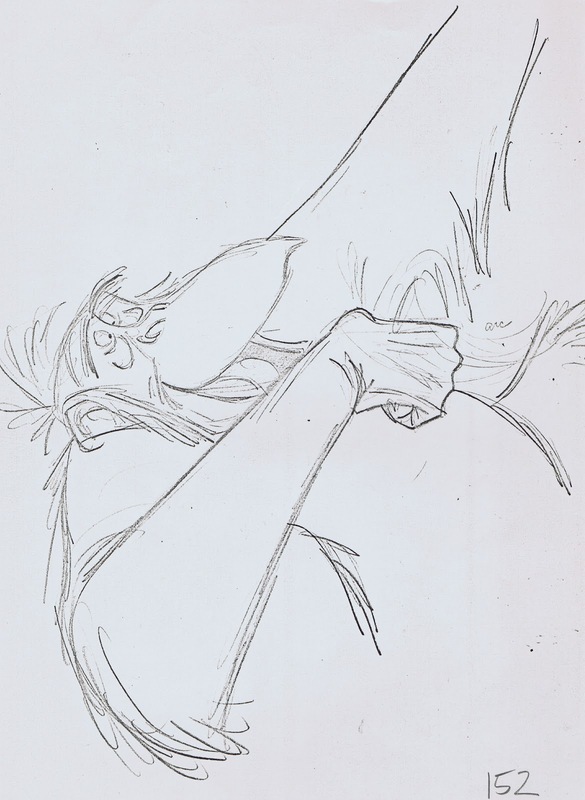 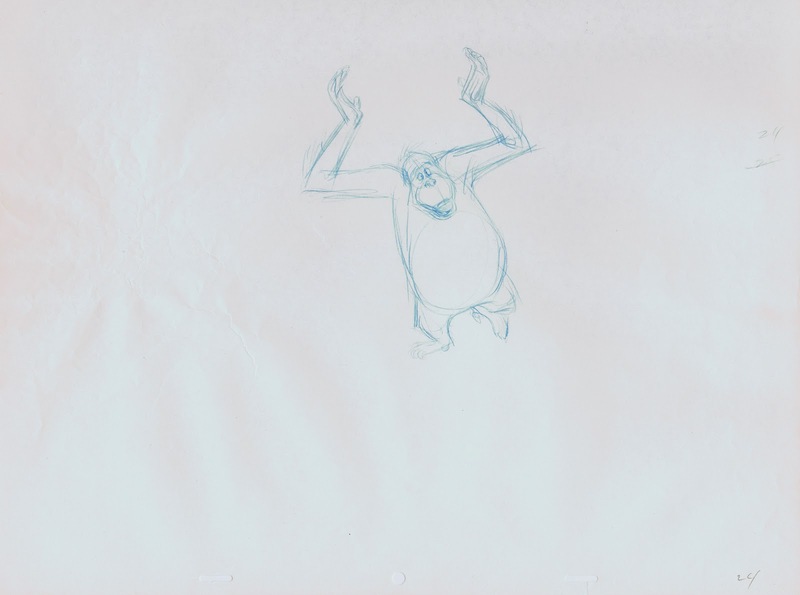 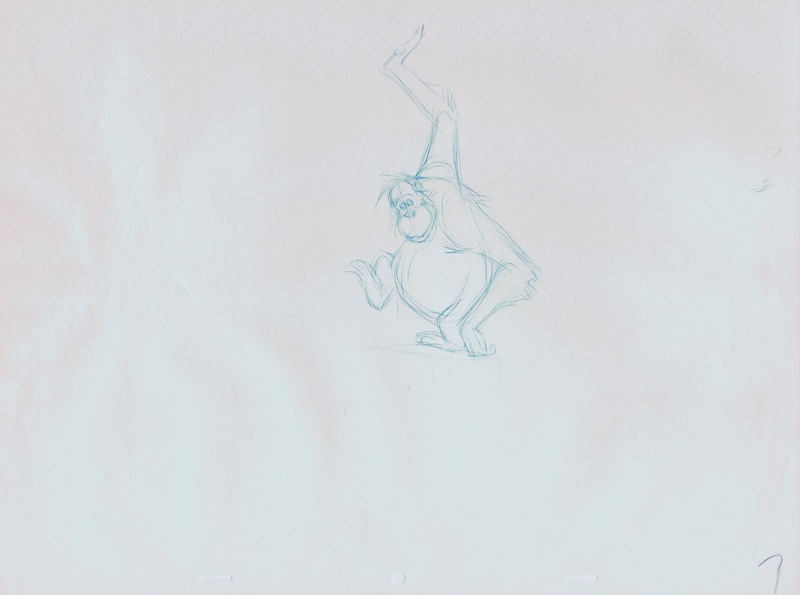 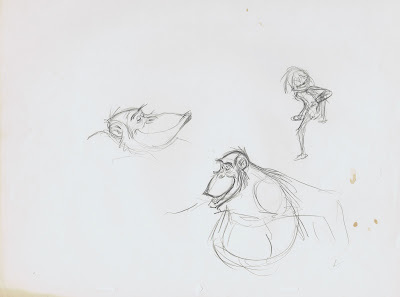 Milt Kahl's comes in when Louie picks up Mowgli from the floor. 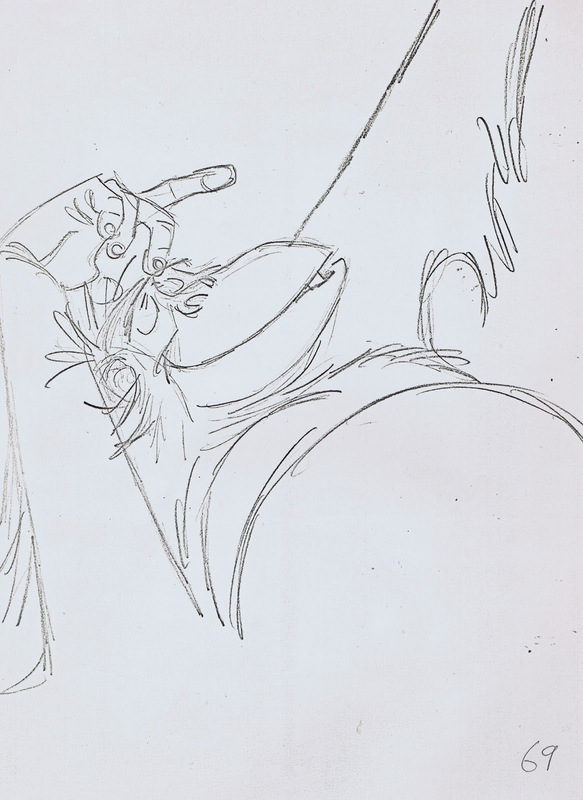 As the song begins Frank Thomas takes over. 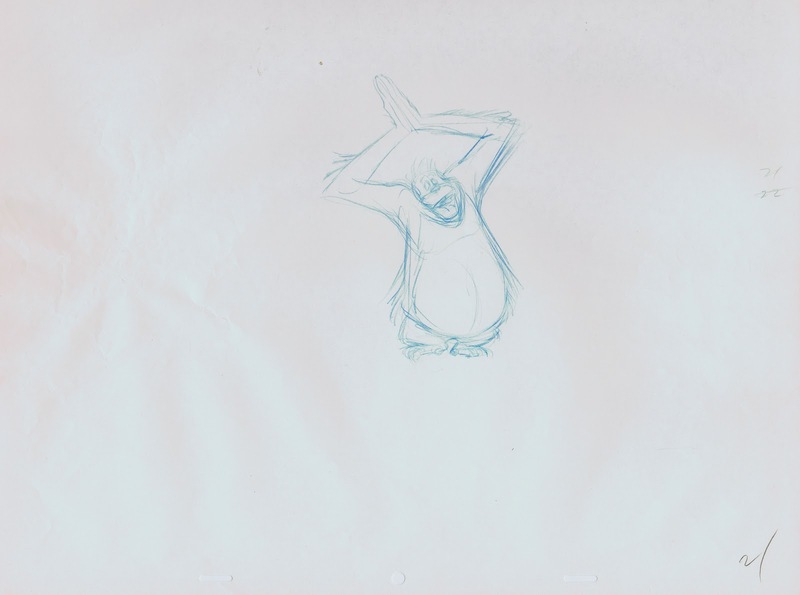 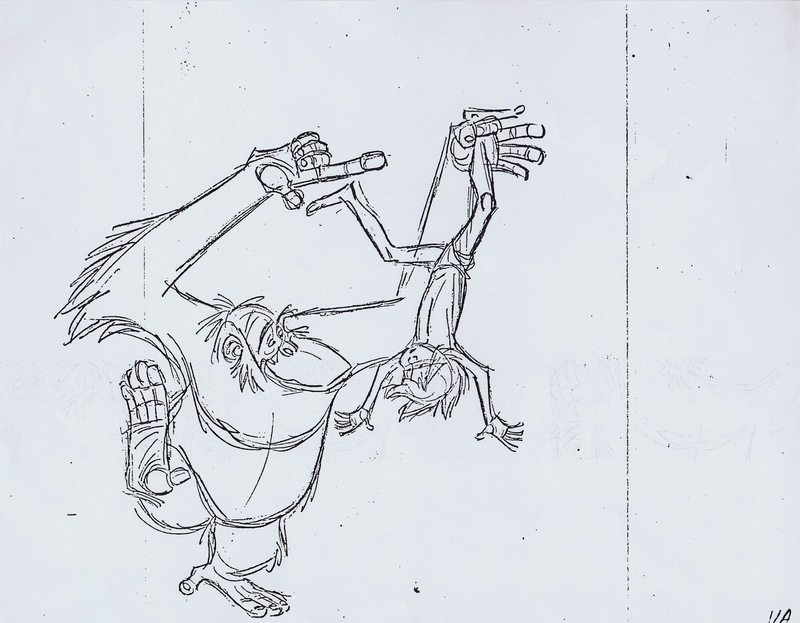 Both animators go back and forth throughout the sequence, until the end when John Lounsbery animates the dance number with Baloo and Louie. 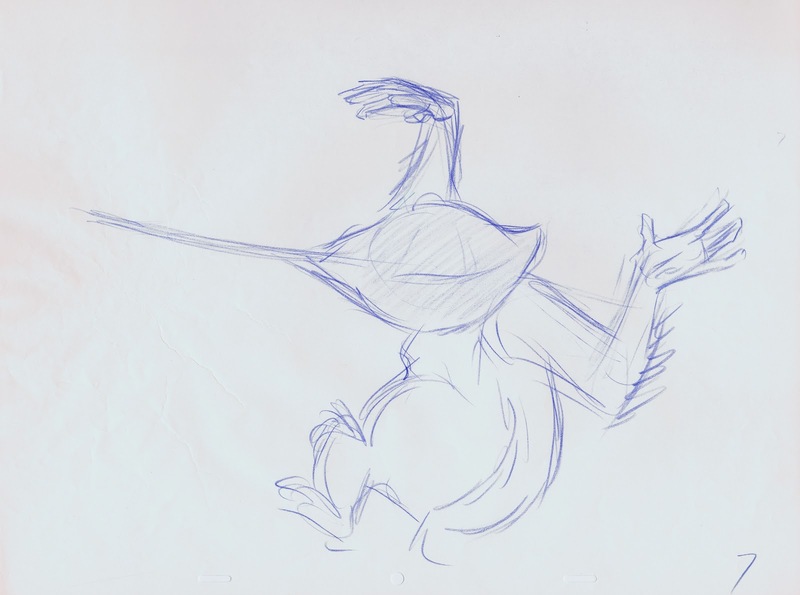 Louis Prima's slightly hoarse voice is just perfect for the character. The Sherman Brothers' song "I wanna be like You" gave Milt and Frank a lot of material to create his eccentric personality. 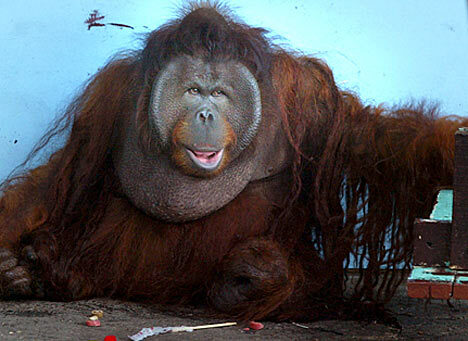 One thing I've been wondering about is why one detail, very typical of male Orangutans, is missing in the character design. 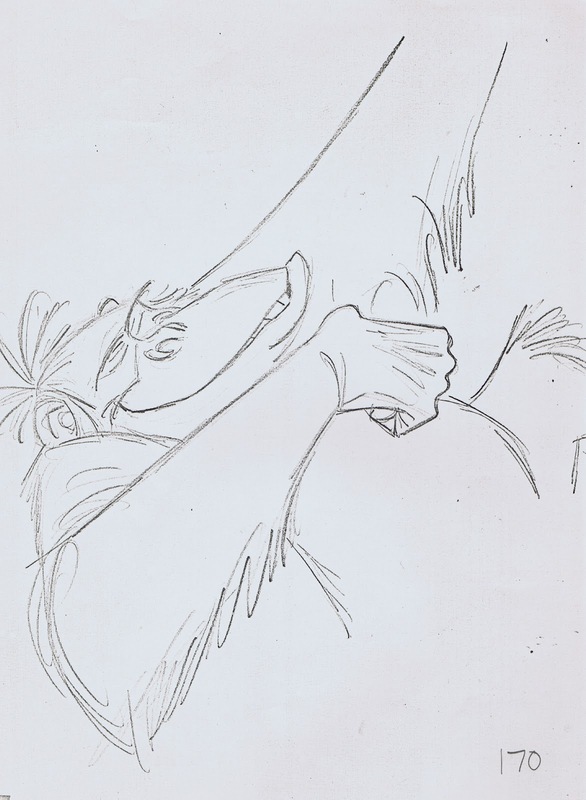 They do have these unique skin flaps for cheeks, and neither Bill Peet, Ken Anderson nor Milt Kahl ever played with drawing those on Louie's face, during the design stage. I assume that they considered them an unappealing feature and therefor left them out. 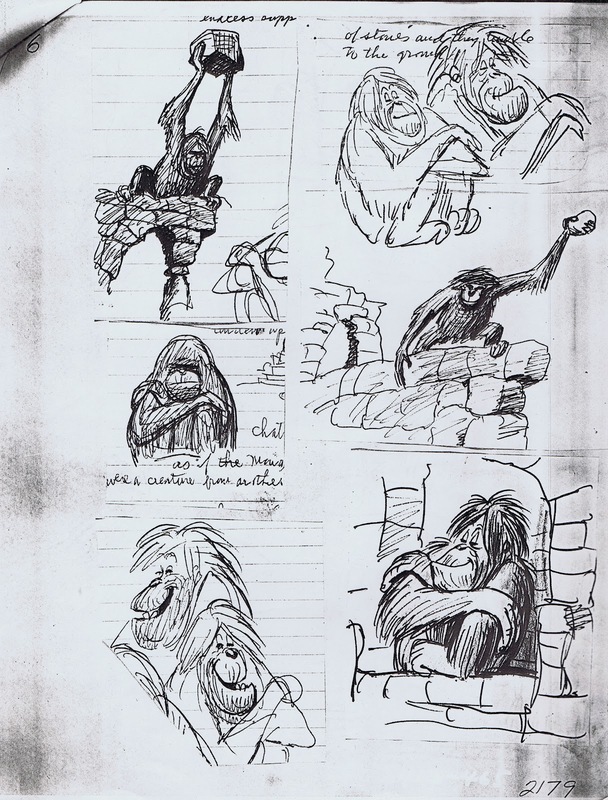 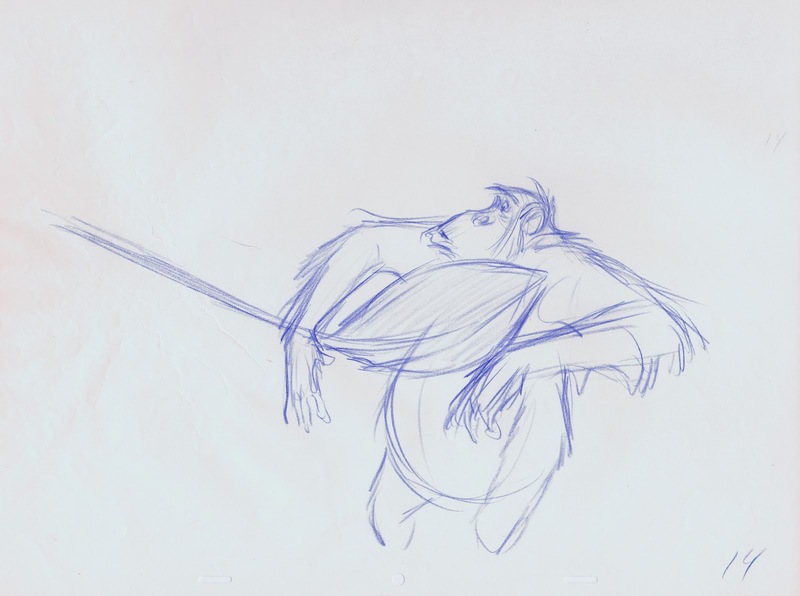 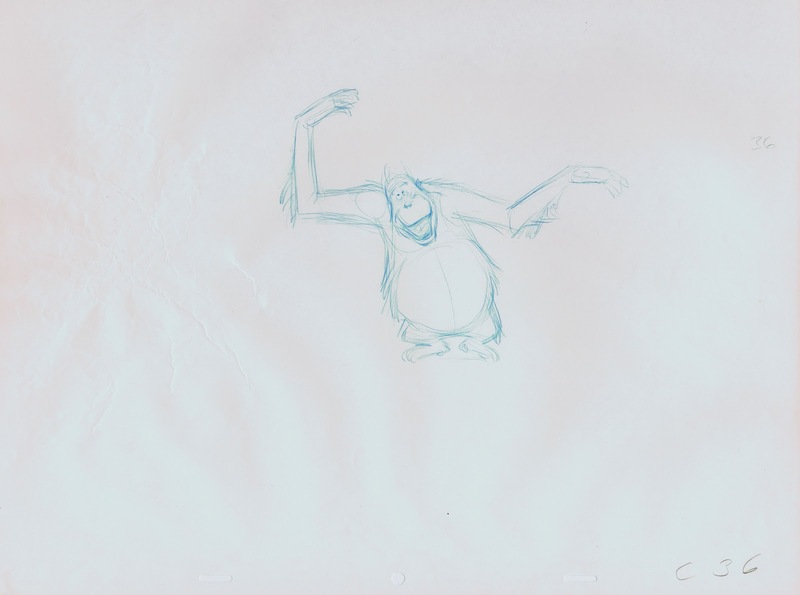 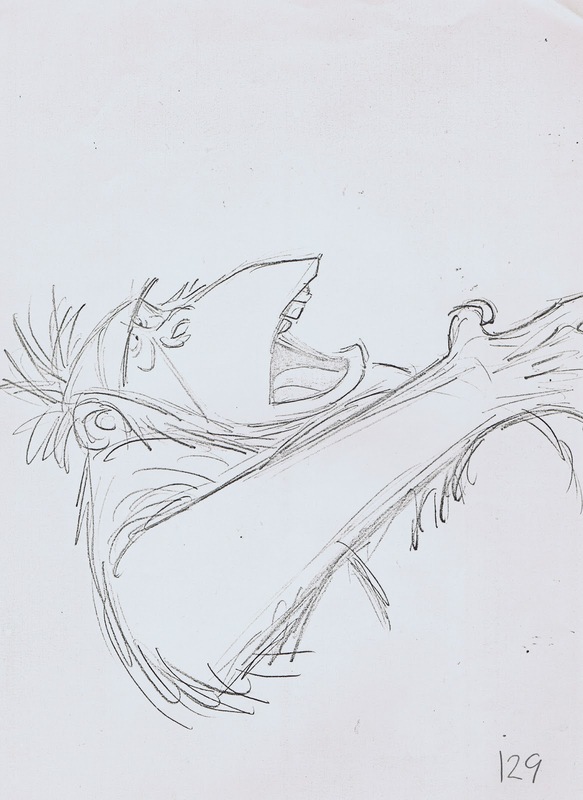 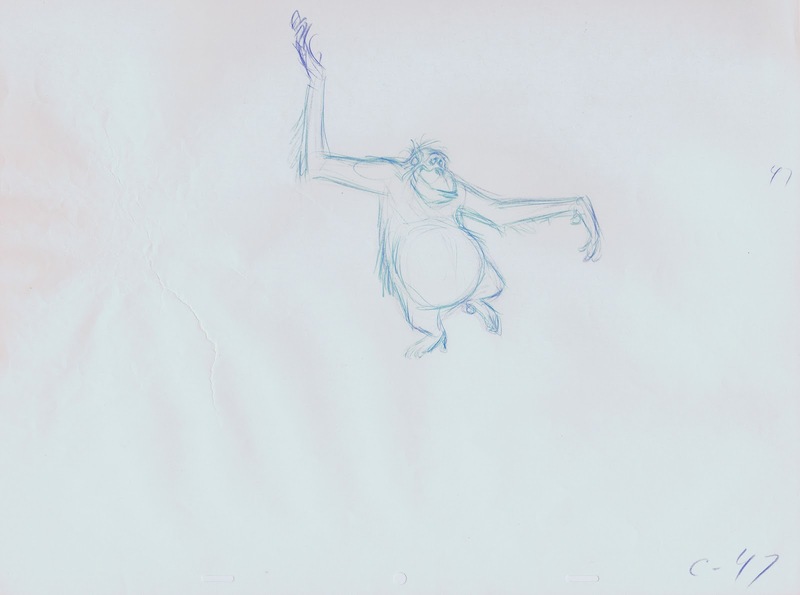 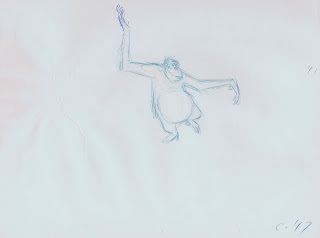 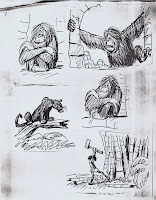 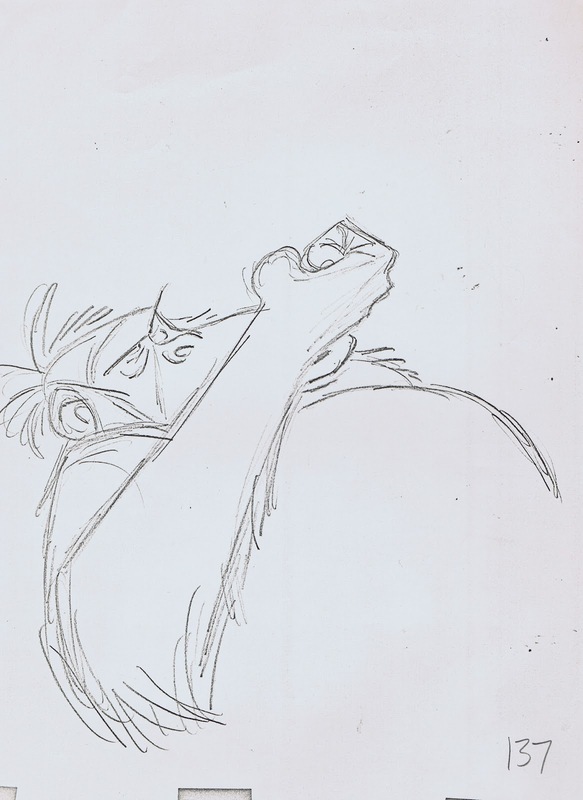 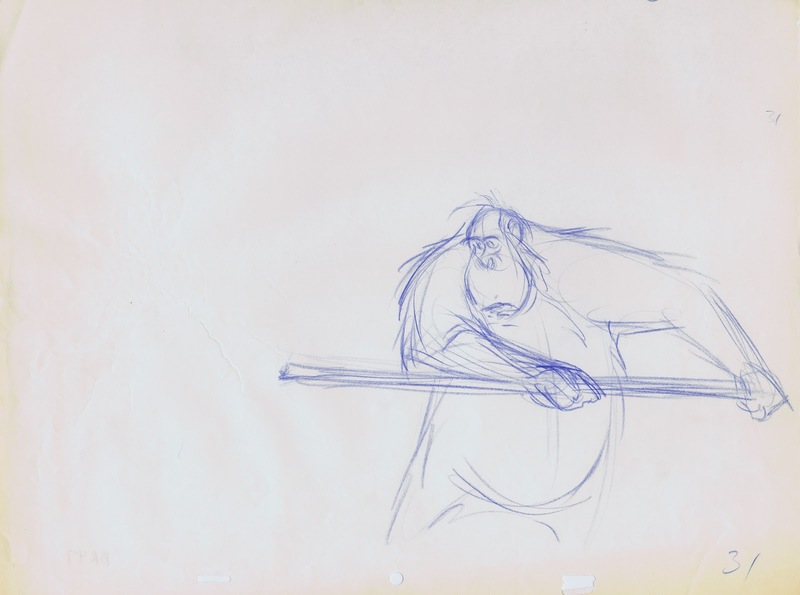 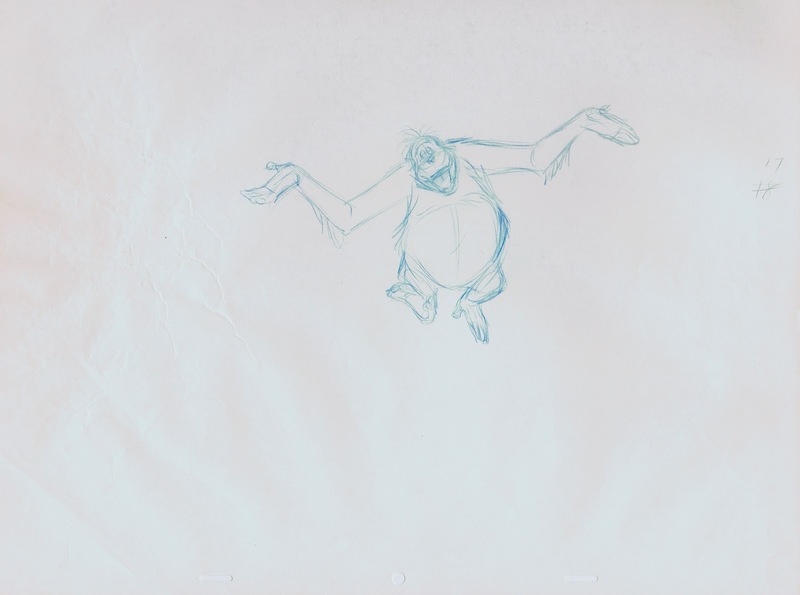 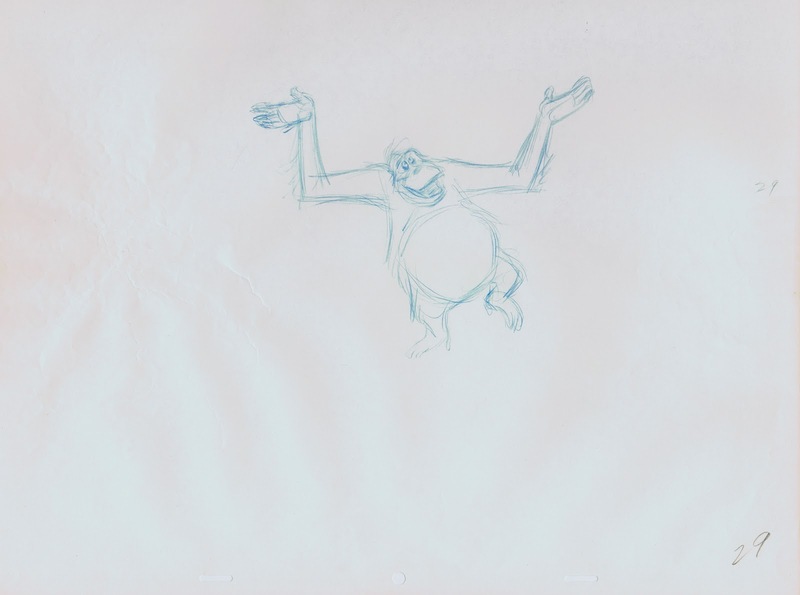 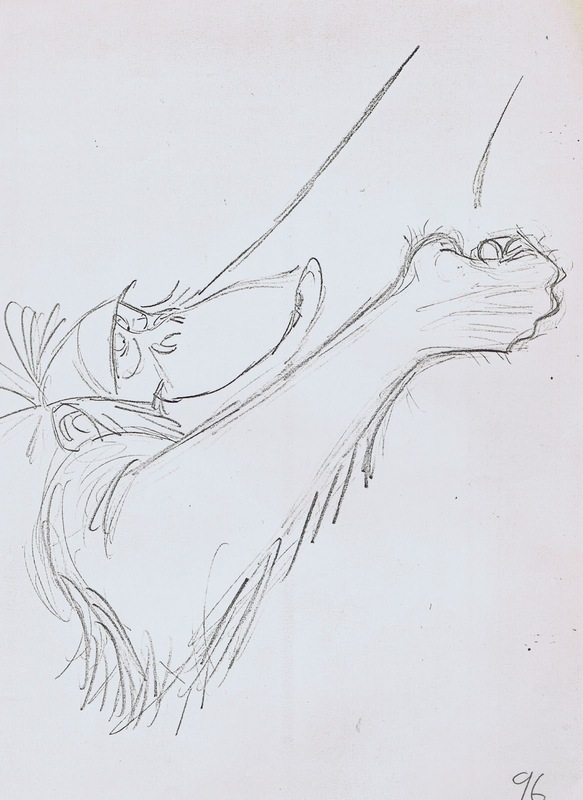 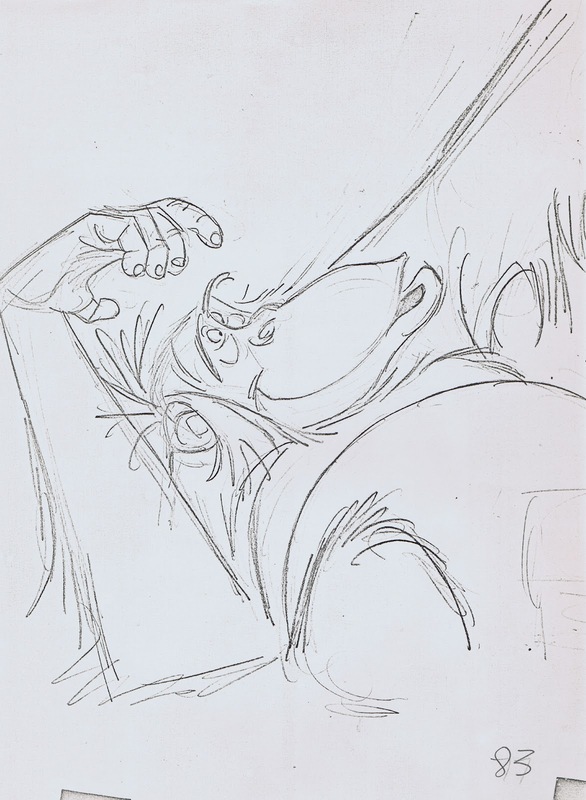 Here is how Bill Peet envisioned King Louie early on in production. 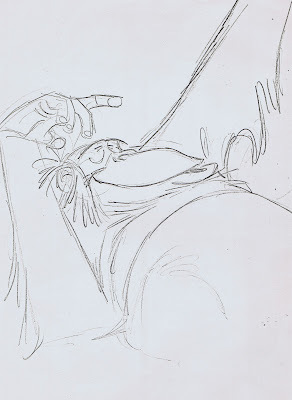 Milt's sense for personality and inventive expressions is off the charts. 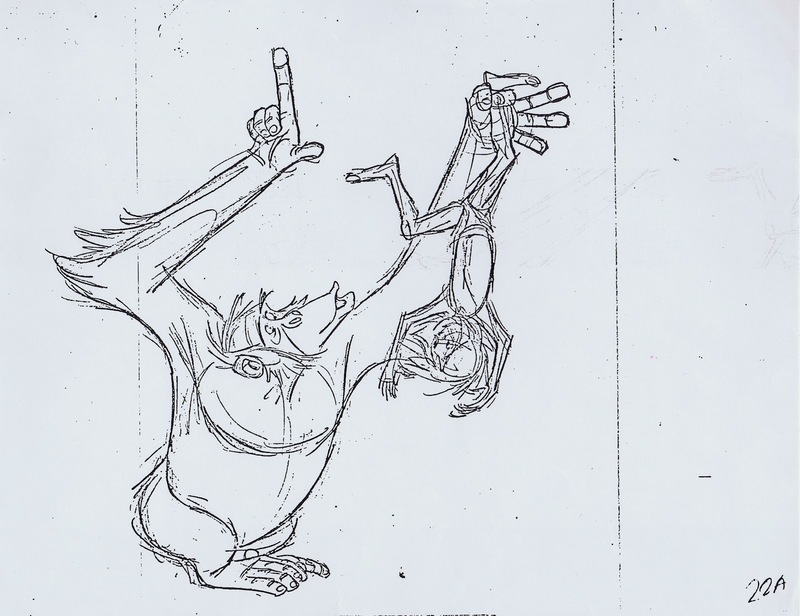 There is something unique in every key drawing. 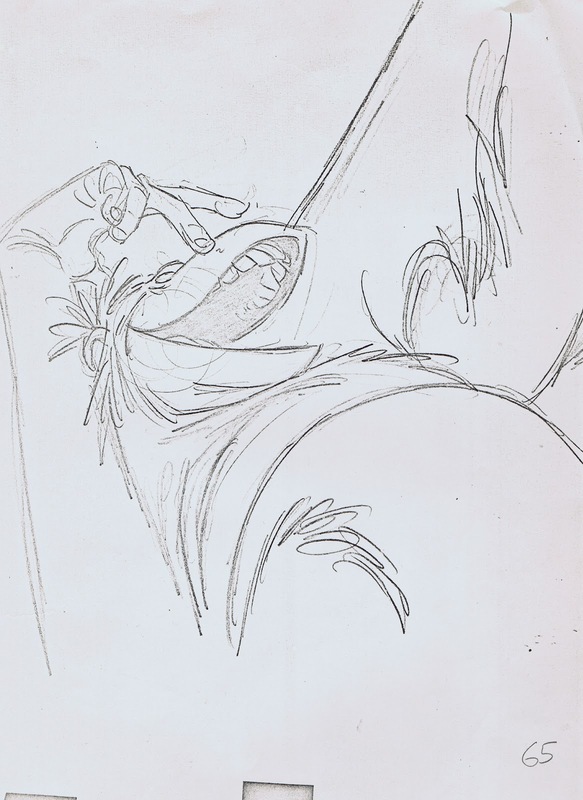 The second one, looking up inside the mouth leaves me speechless. 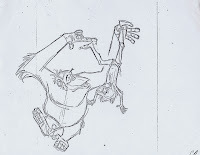 And the acting is really good, too. 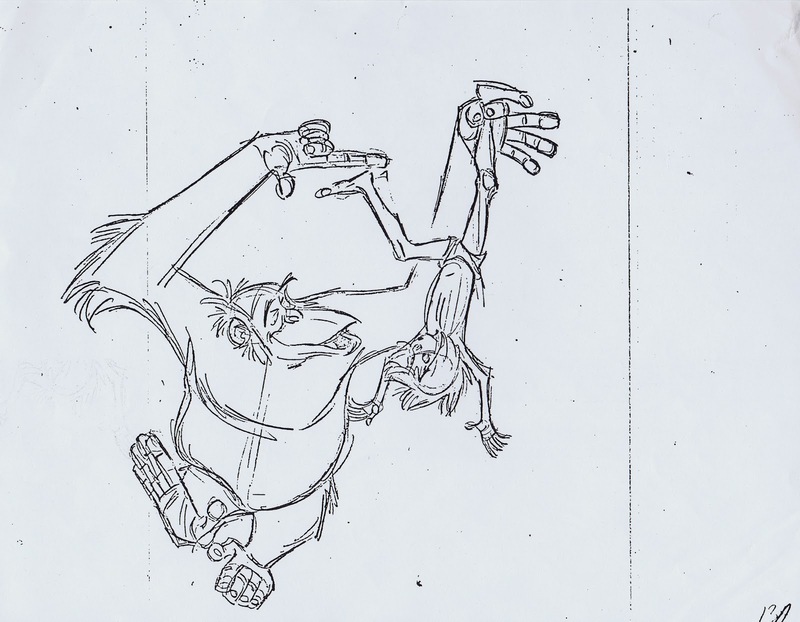 Here he is animating the scene where Louie is about to "feed" Mowgli a banana. 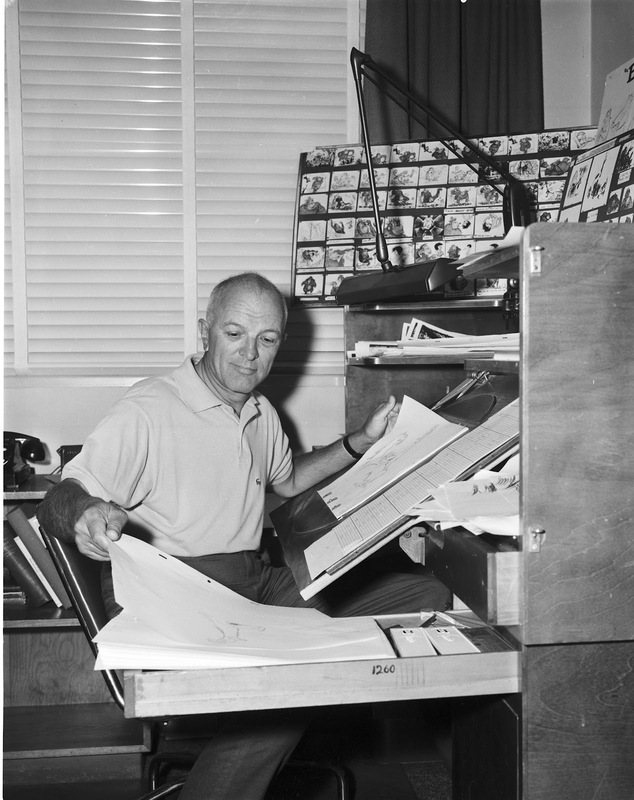 I wished I had a photo of Frank Thomas working on King Louie. 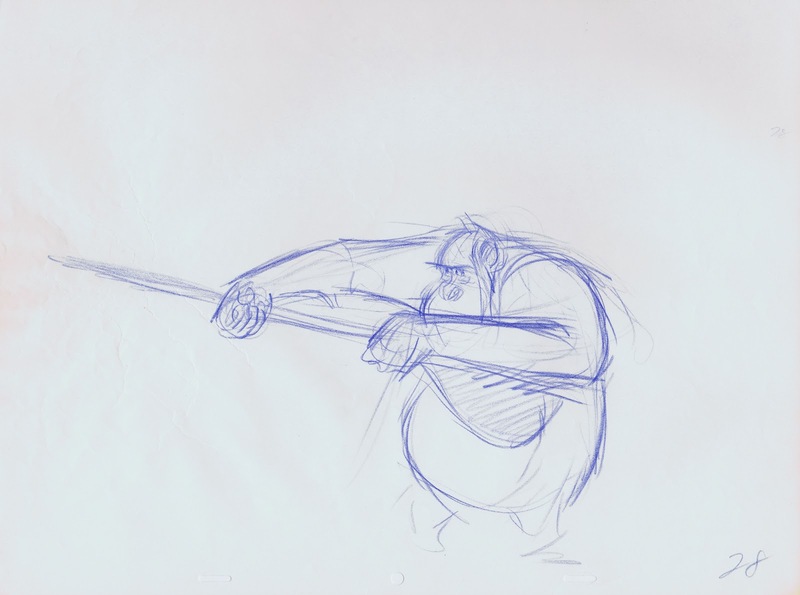 Frank's drawings aren't nearly as refined as Milt's, but the animation is sensational. 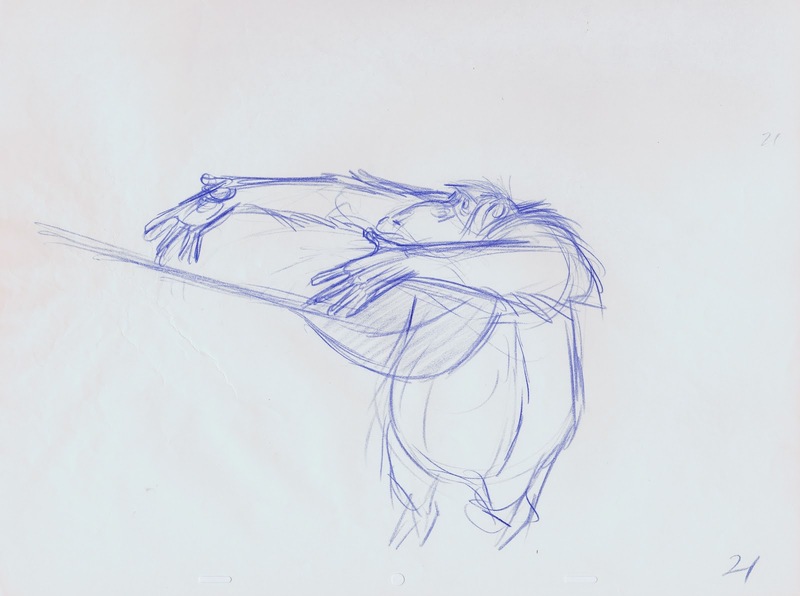 There is amazing rhythm going through the character's body with beautiful overlapping action of his belly and fur. 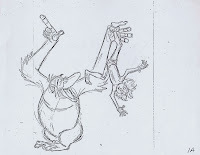 I have most drawings from the following two scenes, and I promise to pencil test them soon.